Amrita Sher-Gil (1913-1941) was an influential painter of India. She was the daughter of Umrao Singh Sher, a Sikh aristocrat and a scholar in Sanskrit and Persian. Her mother, Marie Antoniette Gottesmann, was a Jewish opera singer from Hungary. At the age of 9, she learned to play violin and piano and by early 20’s she and her sister Indira were giving concerts and acting in plays at Shimla's Gaiety Theatre. 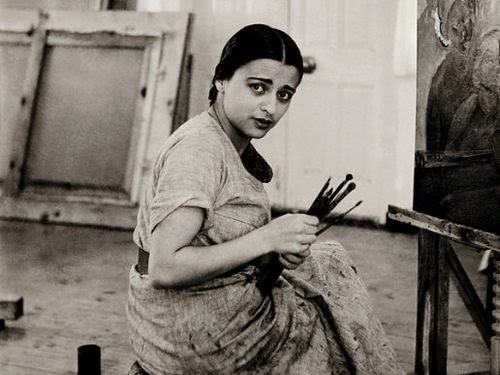 In 1929 at the age of 16 she travelled to Paris to get trained as a painter. In 1934 she returned to India. She married her Hungarian first cousin, Doctor Victor Egan in 1938 and moved with him to India to stay at her paternal family's house at Saraya in Gorakhpur, Uttar Pradesh. In September 1941, she moved to Lahore with her husband which was then a major cultural and art centre. She lived and painted at 23 Ganga Ram Mansion, The Mall, Lahore. Amrita Sher Gil was known for her many affairs with both men and women. In 1941, just days before the opening of her first major solo show in Lahore, she became seriously ill, went into coma and died. The real reason for her death has never been ascertained. A failed abortion and subsequent peritonitis have been suggested as possible causes for her death. Her mother even accused her doctor husband Victor of having murdered her. Inspiring a generation of artists while depicting the plight of women her works have been declared National Art Treasures by the Government of India. A postage stamp was issued in 1978 while Amrita Sher-Gil Marg; a road in Delhi, is named after her. In 2006, painting of Amrita Sher Gil “Village Scene” was sold for $ 1.1 million at an auction; the highest amount ever paid for a painting in India.